Museums are rarely acknowledged in the global discussion of climate change, environmental degradation, the inevitability of depleted fossil fuels, and the myriad local issues concerning the well-being of particular communities – suggesting the irrelevance of museums as social institutions. At the same time, there is a growing preoccupation among museums with the marketplace, and museums, unwittingly or not, are embracing the values of relentless consumption that underlie the planetary difficulties of today. Museums in a Troubled World argues that much more can be expected of museums as publicly supported and knowledge-based institutions. The weight of tradition and a lack of imagination are significant factors in museum inertia and these obstacles are also addressed. Taking an interdisciplinary approach, combining anthropology ethnography, museum studies and management theory, this book goes beyond conventional museum thinking. 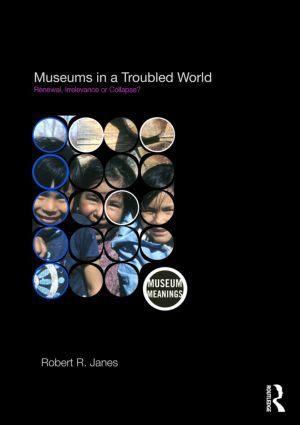 Robert R. Janes explores the meaning and role of museums as key intellectual and civic resources in a time of profound social and environmental change. This volume is a constructive examination of what is wrong with contemporary museums, written from an insider’s perspective that is grounded in both hope and pragmatism. The book’s conclusions are optimistic and constructive, and highlight the unique contributions that museums can make as social institutions, embedded in their communities, and owned by no one. Museums have undergone enormous changes in recent decades; an ongoing process of renewal and transformation bringing with it changes in priority, practice and role, as well as new expectations, philosophies, imperatives and tensions that continue to attract attention from those working in, and drawing upon, wide-ranging disciplines. Museum Meanings presents new research that explores diverse aspects of the shifting social, cultural and political significance of museums and their agency beyond, as well as within, the cultural sphere. Interdisciplinary, cross-cultural and international perspectives and empirical investigation are brought to bear on the exploration of museums’ relationships with their various publics (and analysis of the ways in which museums shape – and are shaped by – such interactions). Theoretical perspectives might be drawn from anthropology, cultural studies, art and art history, learning and communication, media studies, architecture and design and material culture studies, amongst others. Museums are understood very broadly – including art galleries, historic sites and other cultural heritage institutions – as are their relationships with diverse constituencies. The Series Editors invite proposals that explore the political and social significance of museums and their ethical implications. If you have an idea for a book that you think would be appropriate for the series, then please contact the Series Editors to discuss further.